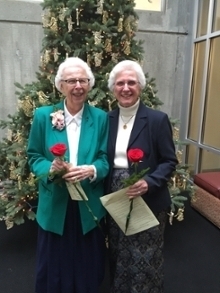 Sister Denis Marie Murphy (left), the 2015 Light of Love honoree, is pictured with Sister Valentina Sheridan (right). The Emory Saint Joseph’s Hospital Auxiliary hosted the 33rd annual Light of Love celebration with two ceremonies at the hospital, honoring Sister Denis Marie Murphy and remembering the Auxiliary volunteers who passed away in 2015. This longstanding tradition at Emory Saint Joseph’s raised more than $6,000 through the sale of Christmas lights placed on the holiday tree in the main lobby. Members of the community purchased lights in honor or memory of a loved one, and the Auxiliary dedicated the tree in honor of Sister Denis Marie for her compassionate care of patients and families. The proceeds from this year’s fundraiser are designated for renovation of the hospital’s chapel. During the remembrance ceremony held in the hospital’s chapel, each deceased volunteer was recognized individually for their years of service and caring for patients and their families. Additionally, family members and friends of each volunteer attending the ceremony were presented with roses and a lighted angel in their memory. Sister Denis Marie presided over the official lighting of an outdoor tree during the afternoon Light of Love ceremony after a blessing from the hospital’s pastoral care department, and was also joined by Sandy Springs Mayor Rusty Paul. “Sister Denis Marie represents families and honors loved ones at Emory Saint Joseph’s. She is a mentor to other chaplains and many times ministers to others without words but with her quiet presence. She is a light of love,” says chaplain Georgia Newman. A 24 year employee of the hospital, Sister Denis Marie worked for more than 17 years as a chaplain, comforting many families in the cardiovascular intensive care unit (CVICU) and in orthopaedics. Today, she uses these same valuable skills in her work as a patient advocate, assisting families with the navigation of the health care system and following up on patient questions and concerns. Prior to her work at Emory Saint Joseph’s, Sister Denis Marie earned her masters degree in religious studies and served in education for 24 years, including 14 years at Our Lady of the Assumption Catholic School in Atlanta. Her subsequent clinical pastoral education ministry includes work with the sick and homebound in a Birmingham, Ala., parish and at Mercy Hospital in Baltimore, Md.